Forecasting the ebb and flow of your physical, emotional, intellectual, and intuitive energies can give you an advantage in everything you do. Business, athletics, your studies, finances, even your love life can benefit from knowing your own personal cycles . . . or someone else’s. 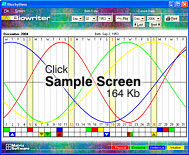 With a single click, Biowriter displays an interactive, full-color onscreen chart of your month. Click on any point and a pop-up text window will give you a measure of that moment. If it is a particularly significant period, you will also receive a suggestion on how best to react. Biowriter also lets you print your chart and a full interpretation of the month. Stick it in your calendar at work, it may come in handy. Using your personal biorhythm chart and report to help plan your month, week, or each day can certainly have a positive impact on your entire life. Note: Downloads are not available immediately. They will be processed by the next business day.